Last week I had a patient present with debilitating right shoulder pain, diagnosed as a partial rotator cuff tear 8 years ago via ultrasound. Despite the incredible healing properties of the body, the lack of causative mechanical mechanisms and her history of psychological pressures, she believed that her pain was due to this un-healing tear. This is a perfect illustration of reductionism - simplifying a complex concept to its more straightforward, fundamental components. Reductionism has its benefits, and also drawbacks. This way of thinking often helps us to get our head around complex paradigms or processes, and for this reason, it is an attractive way of thinking, particularly when it comes to our health. Reductionism has also played an important role in the scientific method, helping us to isolate causative factors, at least in situations where linear causality predominates. The discovery that diabetes was caused by insulin resistance falls into this category, and it's understanding has saved countless lives. Furthermore, reductionism has become the backbone of much of our clinical reasoning and decision making. The appeal of ‘reductionist’ thinking has a long history in health care, however, could this simplistic view of human health be limiting our approach to face-to-face healthcare? I will argue that in the physical therapies, which are concerned with inherently complex interactive systems, ascribing a single cause to a single outcome is not meaningful. It’s no surprise that we’ve naturally taken the complexity of the human body and attempted to break it down into its more-simple components to help describe the problems we’ve faced. After all, the cogs of a machine and each interaction are far easier to understand than to try to surmise how a car works by watching it drive past. 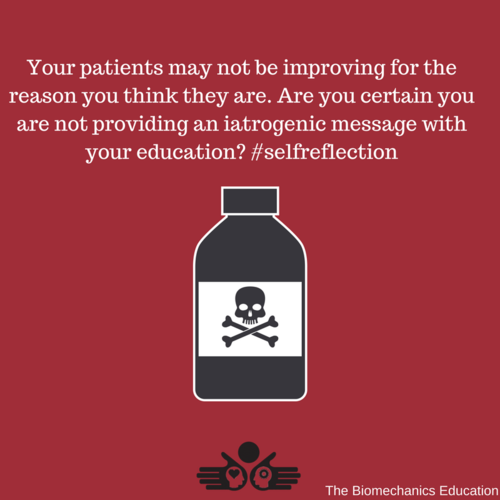 With this, we may have adopted some unhelpful clinical reasoning strategies, as unfortunately reducing the body to being like a machine has proven at times, problematic. Let’s discuss some examples that have led to excessive use of reductionism. In the 17th century, the idea of ‘good posture’ emerged as a part of drill formations demonstrated by the Dutch military, and soon after became reflective of status and societal standing. By the 19th century, anecdotal cases of ‘bad posture’ as the cause of pain or disability were documented by German military medical staff. These origins formed the basis of a now well accepted concept; that there is a causal relationship between posture and pain. This lead to the hypothesis that poor joint alignment was indicative of pain and tissue damage. Furthermore, we began to strive to quantify perfect posture to speculate why people had pain. This ‘structuralist’ view of pain, which views the body as a machine that may wear out, with one pulley that leads to the next, was a plausible, straightforward and somewhat attractive way to conceive pain and attribute diagnosis. Based on current evidence, we have not been able to establish a relationship between posture and pain/future disability in the shoulder, the cervical spine, the thoracic spine, the lumbar spine and every other joint/area of the body you can think of. Despite the lack of clear causative evidence, the fitness industry has been quick to adopt these structuralist views to explain pain. This has led to an industry-wide focus on quantifying perfect movement and joint forces for even mundane tasks. For example, we now see work place ergonomists attempting to quantify the perfect sitting position, therapists of all types prematurely blaming joint alignment, leg length discrepancies, foot postures, fascial trains, muscle imbalances, anatomical variances, and movement patterns as the cause of pain. As clinicians, when we run the risk of over-simplifying complex problems by following a structuralist approach. For example, when an individual comes in with back pain and is referred for MRI investigation, we know a high percentage of the asymptomatic population have these clinical findings. By making causative conclusions between imaging findings and pain, (i.e. a disc bulge and low back pain), we are likely to treat a partial component of the individual, potentially overlooking the primary contributors altogether. It’s also important to consider the potential iatrogenic consequences of providing a structural-based pain narrative for our patients. For example, when we link back pain due to a disc bulge, it may also burden the patient with unhelpful thoughts and feelings that further drives maladaptive behaviours. For instance, a patient who was told their pain is due to structural changes in their discs may adopt movement strategies with less variance to ‘protect’ their structure . Frequently we also see an increase in the prescription of abdominal bracing techniques, despite the literature suggesting that there is an increase in electromyography (EMG) activity of the erector spinae musculature to those of their pain-free counterparts. The narrative of ‘problematic’ structure may create an emotional response, which may influence a patient’s behaviour and approach to their pain. These changes to behaviour and experience of pain promote the cycle of pain/disability. As clinicians, we have to consider that we may have promoted more of a problem than we had to deal with initially. The focus on structural causes of pain may promote a shift in the locus of control from internal and self-empowering, to external; encouraging dependence on the healthcare provider. Therapeutic interventions that focus solely on structural intervention, such as massage or dry needling, reinforce that pain=damage, and may further promote dependency of that patient on their treating practitioner. Certainly, manual therapy may provide short-term benefit and relief, but we need to also consider best practice for long-term outcomes. 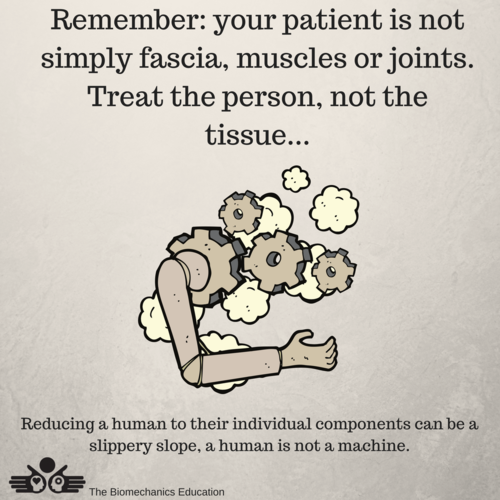 Unfortunately, what we seem to have forgotten is that we are not treating a machine. We are treating a human organism; an adaptable, beautifully complex and intricate being that responds and adapts comprehensively to external and internal stimulus, biologically, socially and psychologically. By reducing our patients’ experience of pain and disability to simply a structural problem is an overly simplistic approach to our understanding of an individual. Dealing with complexity simply, but not simplistically. Pain as an emergent phenomenon. So, how can we approach the experience of pain from a more holistic approach? The concept of emergentism widens the lens of structuralism; it suggests that the experience of pain or adaptive movement is determined from numerous psychological, biological and social factors that emerge together to form a resultant output of pain/altered movement. Importantly, this approach offers a more evidence-based approach with respect to our current understanding of pain science, human physiology and anatomy than that of a linear or structuralist model. Reductionism has been beneficial in our understanding of science and medicine; it has helped us to understand how things work, to hypothesise and develop focused solutions. However, we do need to be wary of the risks and problems associated with over-simplifying complex problems. Assessment of an individual’s complaint, whether it be musculoskeletal or otherwise, requires listening and evaluation of not only the location of the symptoms but also of the individual as an emotional, psychological and social organism. Indeed, to promote ‘healthcare’, it is essential to support positive, holistic and empowering self-care; something that we simply cannot achieve with a reductionist mindset. Brendan Mouatt is an Accredited Exercise Physiologist and Director at The Biomechanics Clinical Practice and The Biomechanics Education in Melbourne, Australia. 1. Descartes, R., Discourse on the method of rightly conducting one's reason and of seeking truth in the sciences. 1980, Hackett Publishing Company. 2. Gilman, S.L., "Stand up straight": notes toward a history of posture. J Med Humanit, 2014. 35(1): p. 57-83. 3. Lewis, J.S., A. Green, and C. Wright, Subacromial impingement syndrome: the role of posture and muscle imbalance. J Shoulder Elbow Surg, 2005. 14(4): p. 385-92. 4. Grob, D., H. Frauenfelder, and A.F. Mannion, The association between cervical spine curvature and neck pain. Eur Spine J, 2007. 16(5): p. 669-78. 5. Christensen, S.T. and J. Hartvigsen, Spinal curves and health: a systematic critical review of the epidemiological literature dealing with associations between sagittal spinal curves and health. J Manipulative Physiol Ther, 2008. 31(9): p. 690-714. 6. Laird, R.A., et al., Comparing lumbo-pelvic kinematics in people with and without back pain: a systematic review and meta-analysis. BMC Musculoskelet Disord, 2014. 15: p. 229. 7. Brinjikji, W., et al., MRI Findings of Disc Degeneration are More Prevalent in Adults with Low Back Pain than in Asymptomatic Controls: A Systematic Review and Meta-Analysis. AJNR Am J Neuroradiol, 2015. 36(12): p. 2394-9. 8. Vlaeyen, J.W.S., et al., Fear of movement/(re)injury in chronic low back pain and its relation to behavioral performance. Pain, 1995. 62(3): p. 363-372. 9. Shirado, O., et al., Flexion-relaxation phenomenon in the back muscles. A comparative study between healthy subjects and patients with chronic low back pain. Am J Phys Med Rehabil, 1995. 74(2): p. 139-44.